Find Corn Mazes near you across America on Hauntworld.com the biggest website in the World that helps Americans find Halloween attractions, pick your own pumpkin patches, haunted houses, hayrides, Halloween events, real haunted houses and much more. Hauntworld features over 500 listings to help you find a corn maze attraction near you. Hauntworld also reviews corn mazes and allows our guests to also rate and review and to share their experience. Corn Mazes are amazing, massive, huge, big and incredible and have saved many of American farmers who struggle to make ends meet. Corn Mazes are a huge draw each fall for people who want to get lost in the corn, spend hours with family and friends! Most American farmers have embraced the concept of creating fall events to help them supplement their income. Farmers have added attractions in the fall such as hayrides, pick your own pumpkins, haunted houses, zip lines, mud runs to yes massive corn mazes. A corn maze is designed by GPS, a farmer plants the corn and once it starts growing they pick the corn where the walk spaces are located thereby creating a maze. Farmers are guides by GPS to know where to pick the corn to create amazing patterns from overhead views. To enter a corn maze prices usually hover around $10.00 per person and cane sometimes take over 2 hours to complete. Most corn mazes will also include towers through out the attraction so you can figure out directions to take to escape. Corn mazes can be a lot of fun for family and friends. Find a corn maze here on Hauntworld.com and don't forget to find a haunted house near you as well! Find everything on Hauntworld.com from real haunted houses to pumpkin patches. Find Corn Mazes, learn the does and don'ts on how to build your own corn maze and so much more. Hauntworld.com is the World's #1 Halloween and Haunted Attraction website. On Hauntworld you can learn everything you ever wanted to know about all types of Halloween and Haunted House attractions, events and find attractions nationwide. IF YOU ARE LOOKING FOR A HAUNTED HOUSE go to the front page of www.Hauntworld.com and use our interactive map to find haunts around the World. As a haunted attraction owner since the age of 15 when I started Spookywoods in 1985 I have always been looking for ways to improve our attractions. I learned through years of experience of what works and what it is not justified to invest our time and money into. I have tried to find a ways to increase the limited time window to make revenue outside the weeks in October on our farm. Being I’m limited to only 3 calendar events per year due to our county permit laws in NC I wanted to find something that would complement the haunted attraction and we could operate in the months of September, October and November. I had seen articles on corn mazes in the national news making huge designs cut out in the corn fields. I found this to be very interesting and something that might fit well with our haunted attraction. Having many years of experience running a haunted attraction we already had figured out the many things you also need for running a corn maze. We have great relationships with local media in TV, Radio, and sponsors. What I had no clue about was the knowledge of planting corn or the means to cut a design into it. As I researched the concept of corn mazes I discovered there is more than just finding your way through a maze. We decided to make our maze a game to find check points throughout the corn field. The amount of check points is important as to not make the game to easy. In our 10 acre corn maze we only use 6 check points that each has a map of your location. Attached to each check point is a paper punch that is used to punch a game card to track your progress. The game card is a great location to promote your haunted attraction with a coupon and for sponsorship deals. Each paper punch cuts out a unique shape as not allowing you to cheat. These punch stations have evolved from a simple map on a piece of plywood to a park quality Plexiglas enclosures. We have found these enclosures to be the only way to prevent the maps from being stolen by cheaters. Keep in mind as you start to develop your sponsorship proposal you can use these punch stations as a great way to sell sponsorships. Now you don’t just have a number for each punch station, but a name like the “Sprint Wireless Punch Station”. Bridges in the maze are another great attraction for the customers to find, even though we don’t require a punch on the game card for the bridges, they are a sought out location for the amazing views they can provide into the maze. Now that you got the game plan for a maze, you have got to have land to plant the corn. We have found that at least a 5 acre area for a small maze is a bare minimum. We have tried the concept of two 5 acre mazes, but this method ended up being more of a management issue than it was worth. I have researched just about every corn maze in the country and found that bigger is not actually better in the cases of corn mazes. The reason for not going to big for us was the time it takes to solve the maze. The size we have found to work best is a 10 acre maze that takes about 2 hours to solve. It is important that the game is challenging, but not to the point of being stressed out. Our motto is “Lost, Laughing and Lovin It”, not “Hot, Tired and Hating It”. We employ one “Corn Cop” per punch station in the maze to patrol the corn to help our customers with directions as requested. Also having staff near by is a safety precaution for people that are couch potatoes and not used to walking for miles. Keep your drink machines close by the exit of the maze as fully stocked at all times, trust me. Now if you don’t have the knowledge and equipment to plant corn hire a farmer that does. We found a local farmer that plants several hundred acres of corn a year. When I approached the 70 plus year old farmer and told him I was looking for help in planting a field of corn to make a maze out of, he said “People pay to walk through corn? You got to be playing a joke on me?” Once you have a farmer on your team he can assist you in making sure the land is in good condition for corn to grow. The region of the country you live in will dictate the type of corn you plant. There are more types of corn than I could imagine. The characteristics you are looking for in a corn plant is one that it has strong stalk strength, broad leaf, can withstand drought conditions and be bug resistant. If you can irrigate your corn field then the drought resistant may not be so important. Your farmer should now what type is best for your area, but it is important to realize you are not growing corn to eat, you want it to be green and healthy in September and October. So, for the Southeastern part of the US, here in NC the best time to plant is late June or early July. I have made a deal with my farmer to plant the corn and he can harvest it in mid November once we are done with the attraction. It is important to realize that opening a corn maze while the temperatures in your area are above 80F that your customers may experience heat exhaustion. This comes from the corn blocking the air flow and creating a dangerous condition in the heat of the summer. Even tough the corn may look healthy we don’t open until September once the heat of the summer is starting to diminish here in NC. Also is highly recommended that everyone take water with them into the maze. We even require the students from schools to enter the maze only after having a snack as a precaution. The business of a corn maze is not only fun but can be a work out for little legs. The next thing you will need is either the knowledge on how to cut your maze out or hire a company to do it for you. I tried our first maze attempt in 2000 by doing it myself, I found out the hard way I was not the man for the job. I found out quick I would rather spend my time doing the marketing for the maze than cutting it out. I have talked to maze owners around the country that claim they can do it much cheaper on their riding mower than hiring a firm to cut it out. However, I have decided that my time and the quality of the maze design is worth the expense of having a professional cut it out. Our mazes are created using latest GPS technology and are very intricate in design. You may not think the design is important while walking through it, but when you show an aerial photo on TV or website of your maze, I would rather have an impressive maze that gets attention from the public and sponsors. When you get front page color photos like this one in your local papers it sells itself. So once you got the team to plant your corn and the knowledge or firm to design and cut out your maze you need to market the maze to the customers. Actually you need to market your maze long before you even plant the corn. On the surface we thought we could attract the typical haunted house patron to our corn maze. The first year we offered a combo ticket with our haunted attraction. Big mistake! The haunted house patron wants to get scared and when they entered the corn at night and no one was trying to scare them, they either damaged the corn trying to scare each other or demanded their money back saying no one scared them. It was a lesson learned very quickly that we had to separate the two attractions. Granted that having the maze open on Friday and Saturday nights was a big draw for youth groups, it still did not warrant being open at night due to the incredible damage being done to the corn by people goofing off and cheating. Even though we have the entire maze taped on each side of the path with 4” yellow survey tape that did not stop the damage. Not to mention our parking lot can only hold about 540 cars so I would rather have the parking space for the haunted house patron paying us $25.00 than the corn maze patron paying us $8.00. 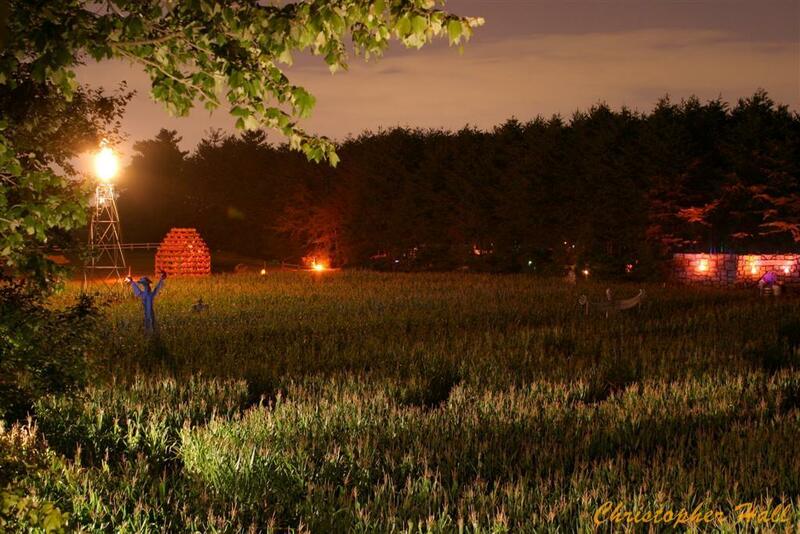 2006 marked our 7th year running the Maize Adventure Corn Maze and the first year we stopped being open at night. Hours of operation are Saturday and Sunday from 1pm to 6pm for the public. We have found that we get the same amount of people to show up and not much damage to the corn. For the guest looking for a scare in the corn we have our haunted corn field that is 2 acres as part of Spookywoods, but it is fenced in completely and not a maze, but a one way walk. We have increased our haunted house attendance every year and I contribute the corn maze as a major factor in introducing our farm to a new audience. The families that visit the farm during the daytime with their children are now coming back at night with other parents for a scary, fun time. Our customers are not just the young teenagers anymore, I see the adults coming back with a corporate group or friends. This group demands a quality show and has the money to pay for it. So, my advice is hook them with a family attraction first then scare them at night. Find Corn Mazes near you across America. Hauntworld.com is the biggest Halloween Events directory on the web and our system allows you to find corn mazes, haunted houses, pumpkin patches, haunted hayrides to everything between. Hauntworld.com features the biggest online directory of corn mazes on the web helping you find over 300 different amazing corn mazes across America. Corn mazes are one of the best and spookiest ways to celebrate Halloween with your family. Find a corn maze today near you, also read our reviews of corn mazes, and leave or share your experience.